Application: Cleaner for moisture reactive polyurethane hot-melt adhesives. Melt this cleaner and pump it through the equipment until the polyurethane hot melt adhesive has for the most part been removed. Depending on the size of the equipment and the length of the tubes, approx. 5 kg of this product will be required. 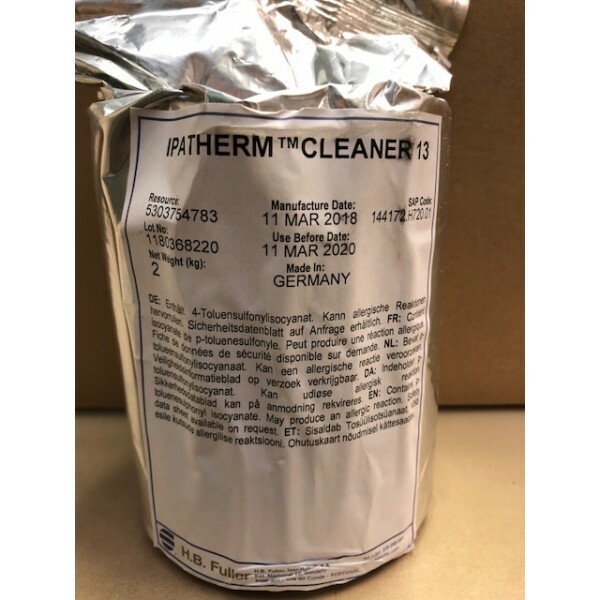 Note: This cleaner is a high viscosity type and therefore suitable for cleaning high viscosity hot melt adhesives. Cleaning with this cleaner is especially recommended after the equipment has not been in operation for a long time. Completely reacted moisture reactive hot melt adhesive should not be cleaned with this product. When the equipment is put into operation again, the moisture reactive hot melt adhesive should be pumped through it thoroughly as residues of the cleaner may otherwise impair the adhesive’s ability to bond efficiently. In original sealed packaging, clean and dry conditions above -25°C and below +35°C. Application Cleaner for moisture reactive polyurethane hot-melt adhesives.